Value at an affordable price! This bag is perfect for anyone who is just starting out in bowling. This bag holds two balls and a pair of shoes neatly inside with plently of room on the outside pockets for extra accessories! If you're looking for a nice quality bowling ball roller at a great price point, look no further! This bag has ample room for 2 bowling balls, a pair of shoes, and a few more accessories. The handle bar locks into place when fully extended and the bag stands up straight without falling over when full. Balls stay in place when in motion as well. great deal. super fast shipping. This is a great bag at a good price. I used the free standard shipping and got it next day! Does this bag have the straps that hold ball in place? Unfortunately this model does not have the retaining straps but the ball compartment is designed to be a snug fit which should help to keep the balls in place during travel. Does this bag hold shoes ? Hello Pk. Yes, this roller can hold shoes. WHAT ARE THE SIZE DIMENSIONS OF THIS BAG? Hi Tom. The dimensions of this roller are: Length 24", Handle length extended 39-3/4", Width 12", Height 16". These wheels will be 3" as compared to the other bag, it will have 5" wheels. 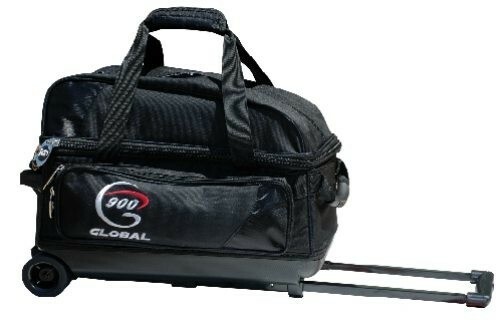 Due to the time it takes to produce the 900Global Value 2 Ball Roller Black ball it will ship in immediately. We cannot ship this ball outside the United States.